HOME PRODUCTS &AMP; SERVICES DIRECTORY OF SUPPLIERS ENVIRONICS, INC.
Environics is a world leader in computerized gas flow instrumentation. Our headquarters for design, manufacturing, sales and service is located in a modern 11,000 square foot facility in Tolland, Connecticut. Environics is also ISO 9001 certified, having received ISO 9001 Quality Systems Certification in April, 1997. Environics is a privately held, Woman Owned business, founded in 1986 and incorporated in the state of Delaware. Our five year projections show continued growth through the introduction of new products and product innovations. All service is handled factory direct. Sales are handled direct and by selected manufacturers representatives and distributors worldwide. Environics' gas mixing technology is based on very precise control of thermal mass flow controllers. Normally, thermal mass flow controllers offer an accuracy +/- 1% of full-scale flow. However, when combined with Environics computerization and calibration, this accuracy specification is improved to +/- 1% of setpoint. The full-scale error vs. setpoint error document shows the 10x improvement in accuracy of a thermal mass flow controller when using Environics controlling technology. 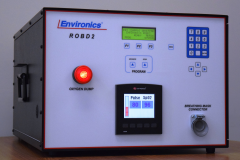 Environics' calibrators and gas dilution systems exceed the accuracy required by the EPA for Ambient Calibrators (ref: Method 205, 40CFR51, 40CFR60, 40CFR75). For more technical information, see the technical documents section on their website, which contains current articles and CFRs pertinent to Environics' technologies. Environics encourages you to challenge them with your most difficult requirements. They have thousands of systems in the field and have developed an extensive library of custom applications and solutions to meet their customers' needs. The application of Environics' technology has enabled them to become the world leader in user-friendly computerized gas flow instrumentation. News and trends in the medical equipment field, and innovations in early detection tools (CAT, MRI, etc.). Look for your first issue of the Medical Equipment Design newsletter to arrive soon. View More Announcements from Environics, Inc.